Good and bad signage on the information superhighway. In 1968 Edward Tufte received a Ph.D. from Yale University, having written a dissertation on the American civil rights movement. During the eccentric course of his academic career he taught political economy and statistics, among other things, but would become increasingly interested in activities quite distant from his formal academic training: large–scale sculpture, for instance; graphic design; typography and book–making. Eventually he founded his own publishing house, Graphics Press, and the titles of the four books he has published under that imprint suggest the chief concerns of the latter part of his career: The Visual Display of Quantitative Information;Envisioning Information; Visual Explanations: Images and Quantities, Evidence and Narrative; and, published earlier this year, Beautiful Evidence. Each of these books evidences a profound respect for the power of well–chosen designs—charts, graphs, outlines, and so on—to convey information quickly and powerfully. But Tufte also reminds us that designs are often ill–chosen and poorly implemented. In this regard he may be best known for his relentless critique of PowerPoint, which, he believes, may have a place but certainly a less pervasive place than it now occupies. Indeed, in Beautiful Evidence Tufte compellingly argues that the inappropriate use of PowerPoint by some NASA engineers to present research about possible loss of foam insulation panels on the space shuttle Columbia led, quite directly, to the destruction of that vehicle and the loss of its crew. 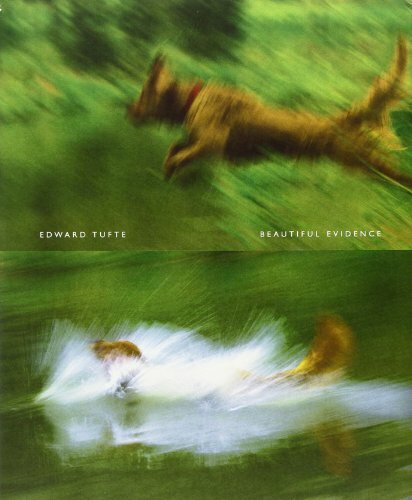 (That chapter of Beautiful Evidence is available on Tufte's website.) But he also shows some of the ways in which overuse of presentation software does less dramatic but nonetheless serious damage to people's ability to grasp information in many everyday contexts, in the business and academic worlds alike. Reading Tufte on these matters can be a life–changing experience for people, like me, who deal in information every day—who are, as the current argot has it, "information workers." After spending some time in Tufte's company you become less inclined simply to accept the usual ways in which quantitative information, or non–quantitative information for that matter, is displayed. You start to ask yourself whether there are more creative ways than you had previously perceived to outline an idea for a book, or summarize historical developments for a college class you teach, or make handouts even for Sunday School or church vestry reports. You learn to try out various ways to organize information—historically, thematically, geographically—and in the process you force yourself to reconsider the way you habitually organize data in your own head. But you also become a more critical reader, or viewer, of other people's visual designs. I became aware of just how much I have become Tufteized when, recently, I was reading The 9/11 Report: a Graphic Adaptation, by Sid Jacobson and Ernie Colón. (Some sample images from the book may be found here and here.) The book comes with an extravagant back–cover blurb from Stan Lee—"It will surely set the standard for all future works of contemporary history, graphic or otherwise"—but as the co–creator of Spiderman and the Fantastic Four, Mr. Lee could be thought rather biased towards the idea that a graphic version of the story is superior to a text–only version. 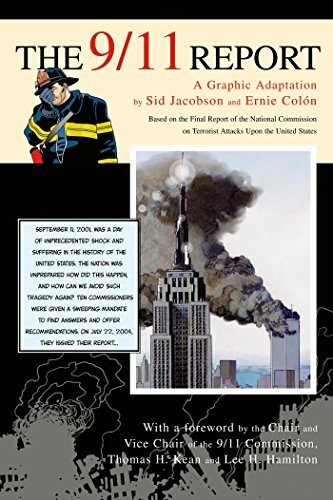 In fact, the first thing that should be said about The 9/11 Report: a Graphic Adaptation is that it is not an adaptation so much as an extreme abridgment. The two pages, 88 and 89, that I linked to above are based on more then a dozen pages of detailed narrative in Chapter 9, "Heroism and Horror," of the original report (which may be found in its entirety here.) One might argue that an image like that of the final panel on page 89—which depicts two people in the South Tower of the world Trade Center looking out their window at the burning wreckage of the North Tower, not knowing that their building is about to be hit—captures some of the human drama of the situation. Indeed it does. However, one could also argue that its need for verbal and even visual brevity prevents it from communicating some of that drama. It is only from the original report that one learns, for instance, that some people who had evacuated the South Tower immediately after the North one was hit decided to re–enter the building and return to their offices, where they were killed just minutes later when their building was hit or when, a short time afterwards, it collapsed. Moreover, even when the "adaptation" is dealing with matters that should be amenable to being pictures, it makes relatively poor use of the powers of graphic display. A timeline showing the progress of the four hijacked planes—the two that hit the World Trade towers, the one that crashed into the Pentagon, and the one that passengers forced down in rural Pennsylvania—extends over several pages of largely blank space. Had this been compressed onto two facing pages we readers could have taken in at once the progress of each flight in relation to all the others. The statement that Osama bin Laden's "network extended to the United States" illustrates that claim with the mapped outlines of the state of New York, Boston, Tucson, Atlanta, Brooklyn—isn't Brooklyn in the state of New York?—and Chicago. These figures, which offer very little information, occupy an entire page. This makes them, in Tufte's terms, extremely "low resolution" graphics: a lot of drawing for very little informational payoff.